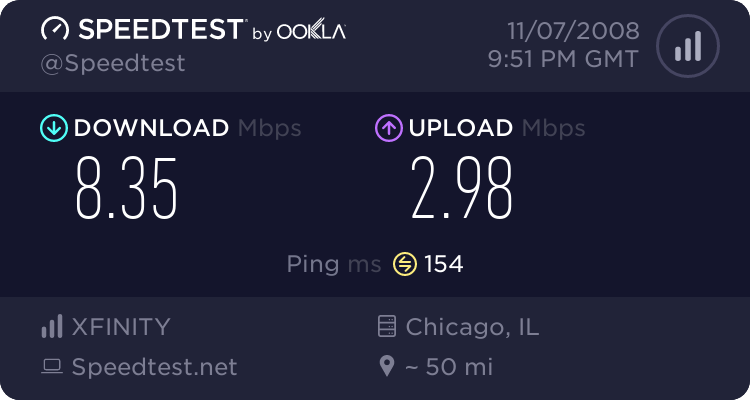 Ever since my brother accidentally dropped a branch through my cable outside, the connection speeds have never been the same, even after Comcast came out to fix the line. 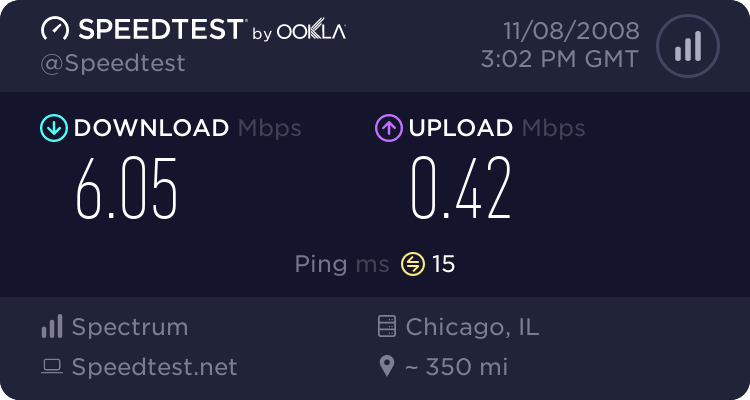 See my previous results in another thread and you'll see that I was getting close to 25Mb/s to my closest server (Chicago, IL). 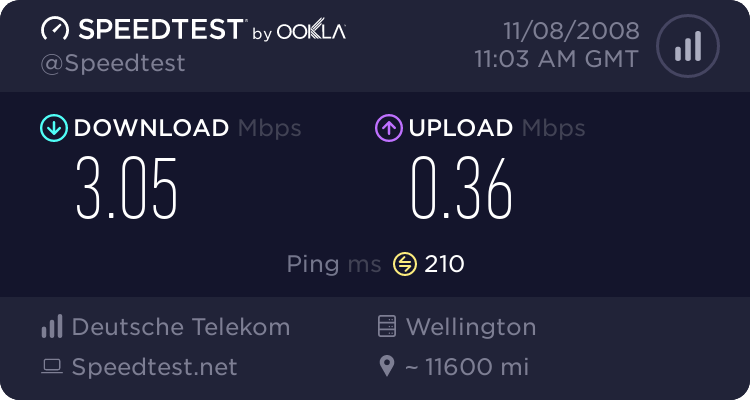 I need to call them to see if I can upgrade to that new 50Mb/s service they're supposed to be offering in many areas. Okay ... I've now hit every server listed in North America, for a total of 93 tests. Of course, some were from before this thread, and some were to other countries. Global Rank: Faster than 97% of connections. Country Rank: Faster than 95% of connections in the US. 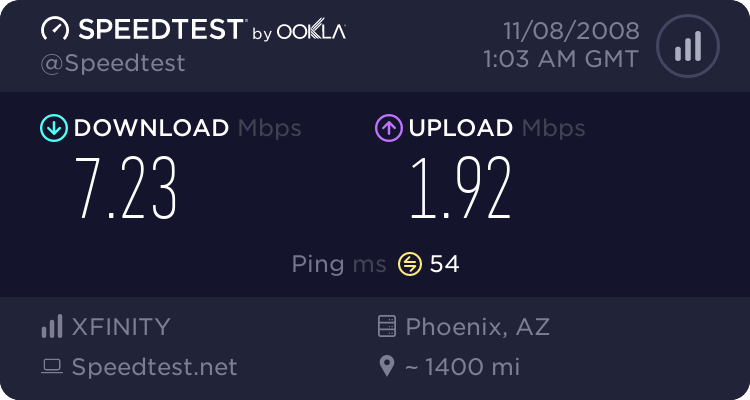 Apparently my connection is a bit slow compared to other Comcast users in Minnesota (averages are 12,359/1,849 versus my 11,586/1,425). 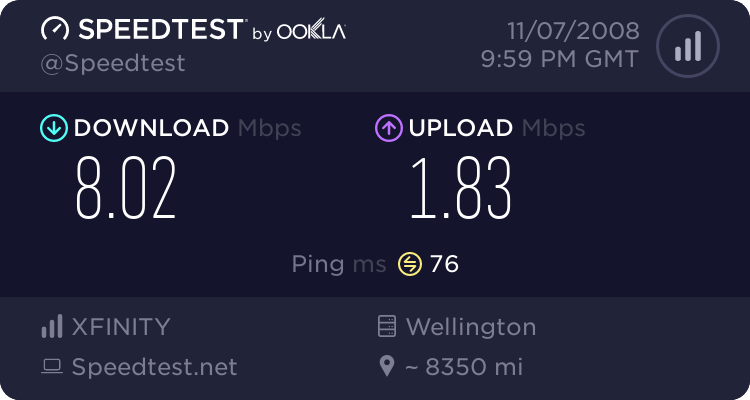 My fastest download was taken from the Owensboro KY server, and my fastest upload was taken from the Hamilton Bermuda server. 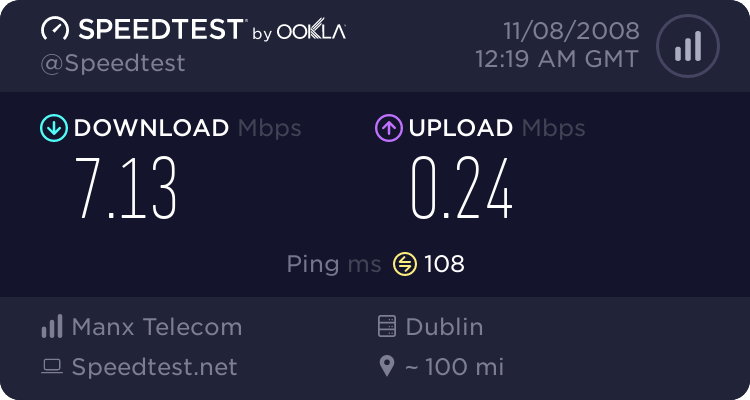 After looking at the global stats, I want to be a customer of VL-Telecom (77,062 kb/s downloads and 60,247 kb/s uploads). Ironically, while North America is the top continent by download speed, the US isn't even in the top ten countries. And for a laugh here is to Auckland! Not bad for an upto 8mg package. Hereâ€™s what I came up with and it is correct and what I pay for. From Lynchburg VA but I get mine from Net Zero because Verizon is useless they don't allow servers and their service is terrible so I get mine from Net Zero for 29.00 USD a month and Net Zero rents from Verizon. I will give you a nice laugh. For phone, internet, caller ID and "modem rental" I pay $73 (US)/month. 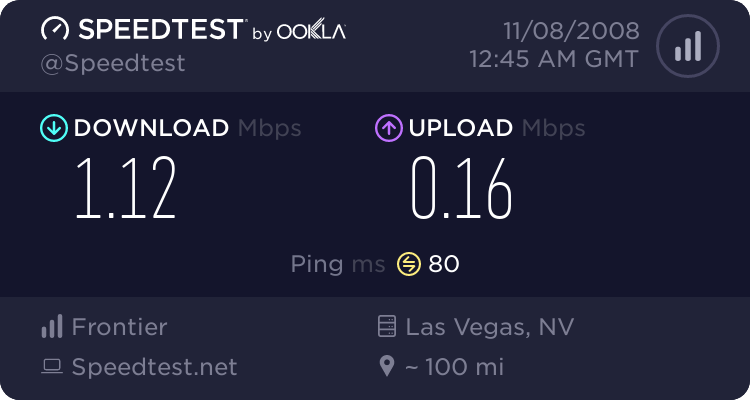 Here in Albuquerque Speedtest often shows shorter ping time(!) and faster link speed to some servers farther away. I've got Comcast, so under their recently revised Acceptable Use policy use in excess of 250 Gbytes/month is deemed excessive. 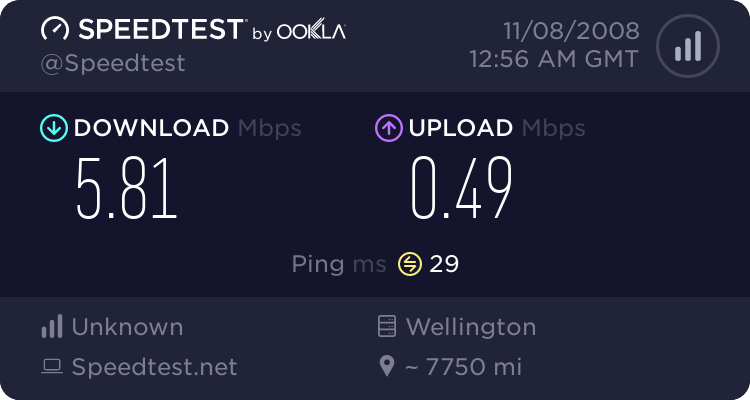 One further reservation: I took this speed test from my daily driver PC, which suffers the indignity of a wireless link on the way to the cable modem. Message 828084 - Posted: 8 Nov 2008, 1:10:04 UTC - in response to Message 827936. 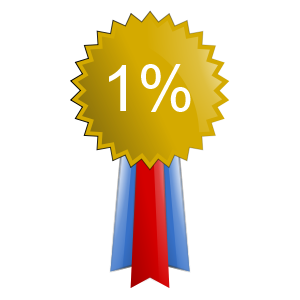 Here is my test. 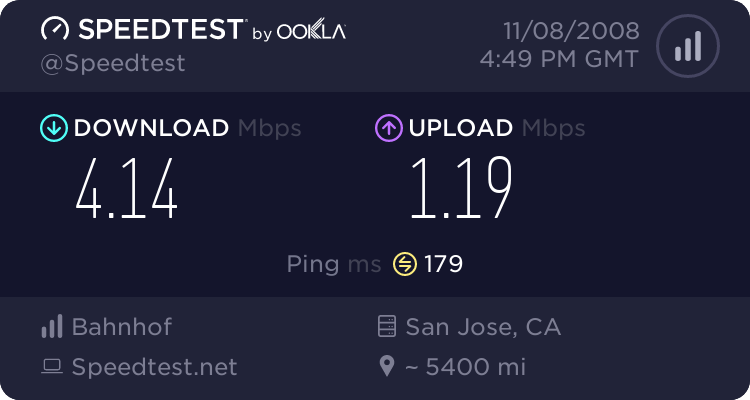 ATT just opened up DSL to our area in the last couple of months. It is a bit slower than what it could be, but we are on the fringe of the DSL area at this point and service would not improve without ATT upgrading wire to our area. 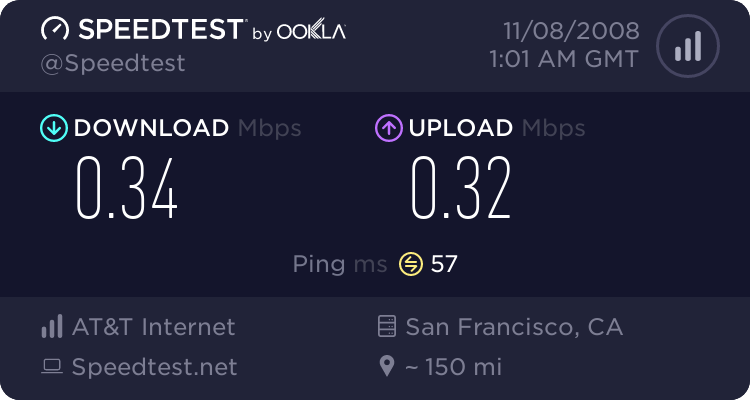 ATT only costs me $10.00 a month for this, and my old dial up ISP had been $15.00 a month. Message 828089 - Posted: 8 Nov 2008, 1:14:25 UTC - in response to Message 828084. Message 828096 - Posted: 8 Nov 2008, 1:22:01 UTC - in response to Message 828089. I will take this any day over dial-up. 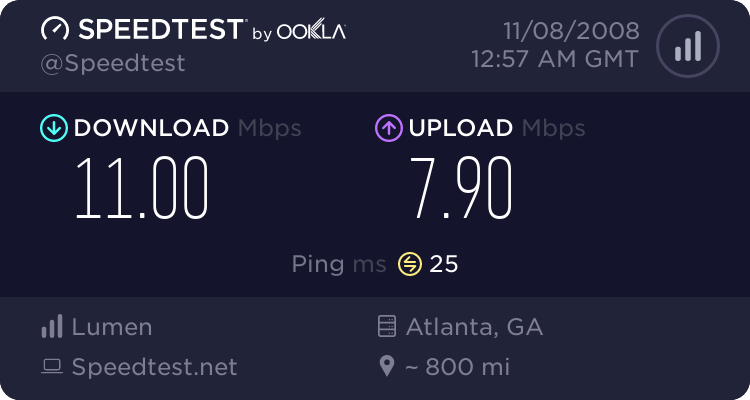 And, the ATT tech said I would be lucky to get 220 down at our location when he set it up. I feel like the extra is gravy. . . And my old ISP is extremely spamy at this point. I can not even forward email from my old account to my new accout. 1500/256 account, usage capped at 4GB peak times plus 4GB off peak per month. Mine appears relatively slow compared to most. upstream is bit low... might be all my proxy and filter stuff. 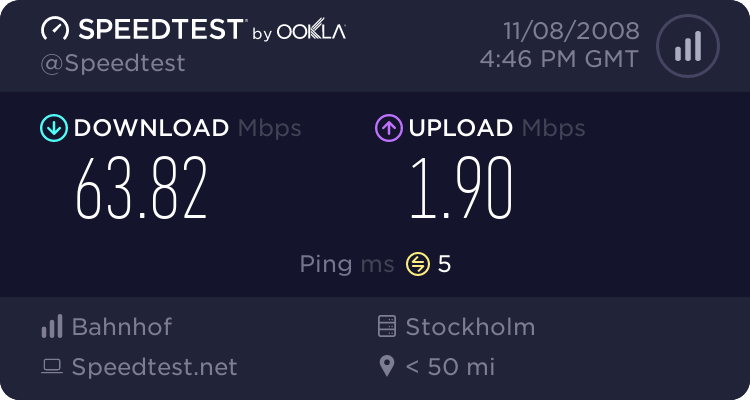 Just remember that depending on what country you are in the gov't throttles max up/download speed. A few years ago I was getting your numbers. 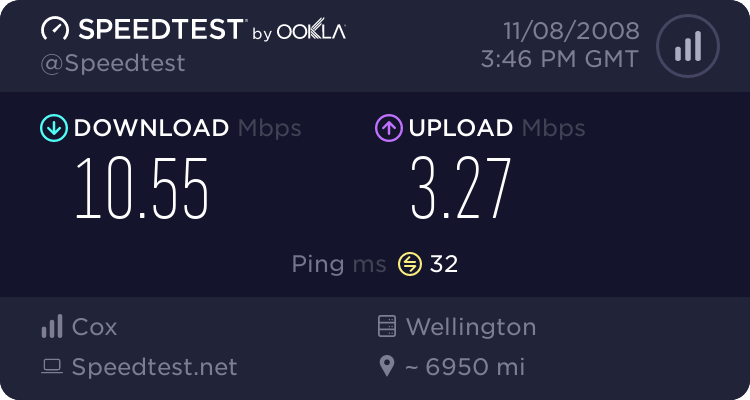 The cable company upgraded the local lines to optical fiber and bam I'm flying. Wow I feel kinda lucky about my upload speed. 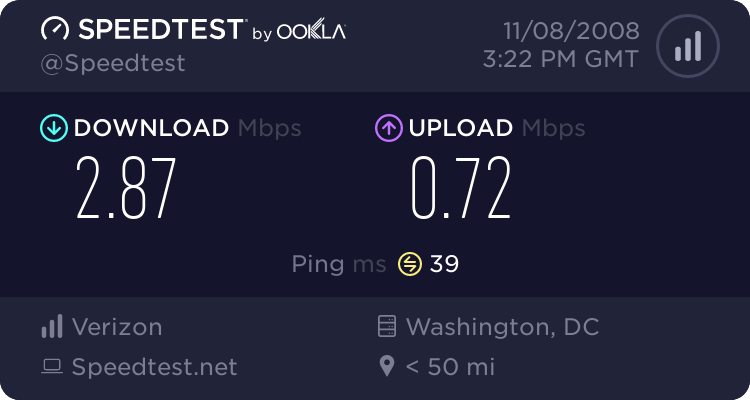 Paying for 12mb down and 1mb up here, $45 a month (US). 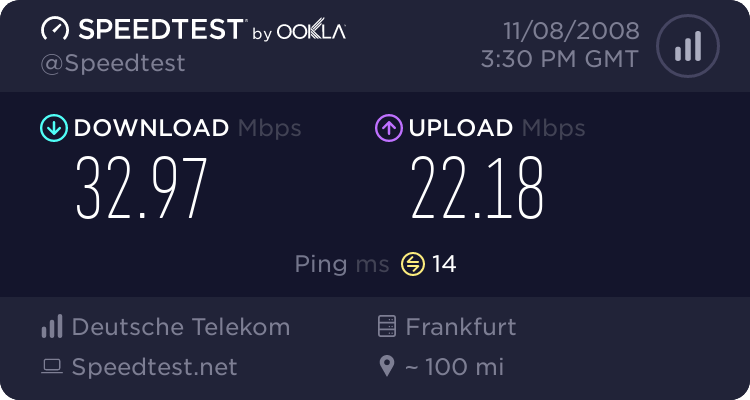 Upload Speed restrikted in my router.